Nope, this isn’t a sponsored post, not a blogger event, nor a freebie-induced blog endorsement. It’s just a project I support, and something you guys might find useful as well. Ever since my husband and I started to work out regularly, we also bought a few new gym wear. Nike and Adidas are our favorite brands. We both prefer Nike for our shoes, however, and Adidas for the clothes. The designs of Nike shoes have always stood out for me, until Adidas recently released this cool new pair of women’s running shoes. The price tag for this baby is Php3,900++. Almost Php4,000. But I only got mine for Php2,900++. 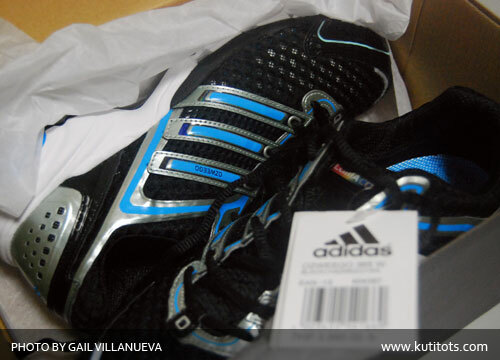 That’s Php1,000 off the regular price, just for donating an old pair of usable rubber shoes. Donate an old pair of still-usable (in good condition) rubber shoes, and you get Php1,000 discount if you buy new Adidas shoes amounting to Php3,000 and above, and a Php500 discount for Php2,999 and below. One old pair = discount for one (1) new one. The best thing about it, you can donate rubber shoes of any brand. This is very true, since the shoes I donated were an old pair of New Balance rubber shoes. 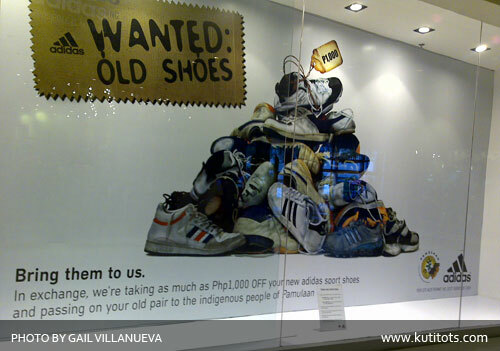 The shoes will be donated to the Pamulaan Center for Indigenous People’s Education. I think this is only until May 17, so do make sure you donate before that. This entry was posted on Friday, 15 May 2009 at 7:08 pm and is filed under Fund-raisers and Projects. Aw crap, I missed the ‘deadline’. Damn. Don’t worry! It’s extended till May 30 🙂 I saw an updated poster last time I passed by an Addidas store and Toby’s sports shop. Kakabili ko lang ng sapatos kahapon pero parang tempting to ah. I want a good pair of crosstrainers. Hmm. Yup! Meron sa Toby’s. Makikita mo naman yung poster ng Wanted: Old Shoes kapag participating store sila. hey gail, my husband and I are rubber shoes and sneakers fanatics. We have over 25 pairs of Nike, Adidas and Puma shoes at home. 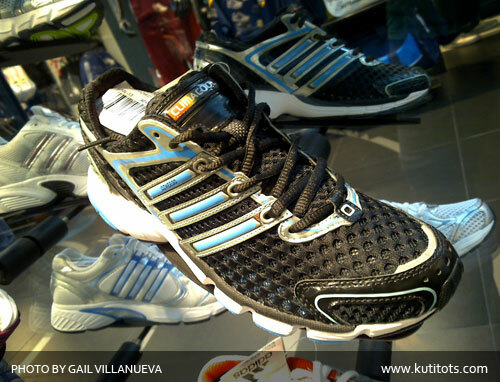 I traded my 2 pairs of rubber shoes (Adidas and Nike Pegasus) at Greenbelt 5. Hubby traded his old Superstars for a new pair hehe!